For World War I, it was Allied troops wearing gas masks in the trenches in France. For World War II, it was the dropping of atomic bombs over Hiroshima and Nagasaki. And for the recent war in Iraq, it was the dehumanizing photos of detainees at Abu Grahab prison being piled naked in a pyramid, a prisoner being held by a female guard with a leash and another prisoner standing on a box with a hood over his face and wires attached to his body. 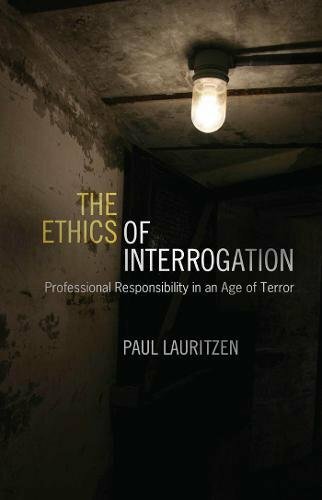 It is this important issue that is the theme of Paul Lauritzen’s intriguing and thought provoking book, The Ethics of Interrogation: Professional Responsibility in an Age of Terror. Mr. Lauritzen takes an interesting approach to this controversial subject. Rather than write a polemical treatise, he instead explores how different professionals and their organizations, ranging from psychologists and lawyers to doctors and military officers, viewed the practice of “enhanced interrogation techniques” (EITs) and what they did, or did not do about it. Interestingly, the author does not issue a sweeping indictment of all types of harsh interrogation techniques, despite the fact that throughout the book he is critical of many professionals for taking part in interrogations. For example, toward the end of his book, he lists ten EITs that were approved by the Bush administration. These were 1) attention grasp; 2) walling (shoving against a wall); 3) facial hold; 4) facial slap (insult slap); 5) cramped confinement; 6) wall standing; 7) stress positions; 8) sleep deprivation; 9) insects placed in a confinement box; 10) water boarding. He finds these techniques to be abusive. This argument seems quite subjective and unfortunately undermines the moral high ground that Mr. Lauritzen takes for most of his book. Mr. Lauritzen also fails to discuss one of the most obvious questions concerning EITs and torture; namely, were they effective in any way during the war on terrorism? The popular movie Zero Dark Thirty made the case that they were—particularly in gaining information as to where Osama bin Laden was hiding in Pakistan. Many interrogators in the US government, however, disputed the accuracy of the movie and argued against the usefulness of EITs. Mr. Lauritzen’s book would have been improved by including at least one chapter on this issue. The book also suffers from too many sections with extensive quotes and long excerpts from organizational and committee reports and various individuals’ books and articles.This only detracts from the flow of the author’s argument. Nevertheless, The Ethics of Interrogation is an important and pioneering book. Paul Lauritzen is to be commended for providing us with an insightful look into the ethical issues that are raised in the interrogation of suspected terrorists. Jeffrey D. Simon is an internationally recognized author, lecturer, and consultant on terrorism and political violence. He is president of Political Risk Assessment Company, Inc., and a visiting lecturer in the Department of Political Science at UCLA. His most recent book is Lone Wolf Terrorism: Understanding the Growing Threat released in February 2013.